Solo Piano mixed with flute and cello, some songs blended with nature sounds. 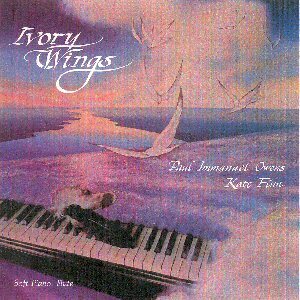 Ivory Wings features the very talented Kate Finn on the flute. Her unique use of soprano/alto flute creates and adds to the warmth and texture of the music ... taking the listener to places near and far. Selections of this work have been aired on KINK FM “Lights Out” as well as on other radio stations. Music is the sound and rhythm of nature, poetry with wings, soaring into thee infinite ... into the timeless... You are the image too large for words. too free to become imprisoned yet carried in our hearts.